Yes…there’s nothing like a little bit of Huck Finn and some watermelon to get you thinking about summer…and all the new adventures you’ll have! No worries…the long, lazy days of summer will arrive although I know in some places it seems it will take forever. Stay hopeful my friends, and to get you in the right frame of mind…here’s a primer on growing watermelon! The Cucurbitaceae or cucurbit family (also commonly referred to as the cucumber, gourd, melon, or pumpkin family) is a medium-sized plant family, primarily found in the warmer regions of the world. Watermelons are indigenous to tropical Africa, where they are found wild on both sides of the equator. They were developed from a native African vine. Their cultivation by man dates back 4,000 years to the ancient Egyptians, as proven by artistic records. Watermelons spread from ancient Egypt to India and Asia, and were widely distributed throughout the remainder of the world by Africans and European colonists. Watermelons are warm-season crops that grow best at average air temperatures between 70 and 85 °F. Melon seed does not germinate well in cold soil. The soil temperature at the 4-inch depth should be 60 to 65 °F before this crop is planted. In the spring, do not plant this crop until after the last chance of frost. 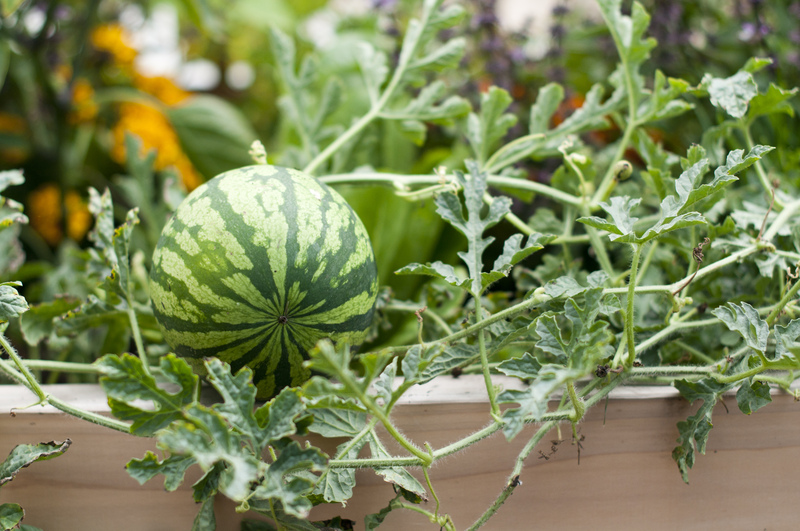 Recently bush and mini varieties of watermelon have been developed for small gardens. These watermelons take half the space of traditional watermelons without giving up any of the sweet, juicy taste. Bush watermelons weigh an average six to eight pounds. The short vines of growing bush watermelons produce fruit with few seeds. The Saveur list shows many mini types. 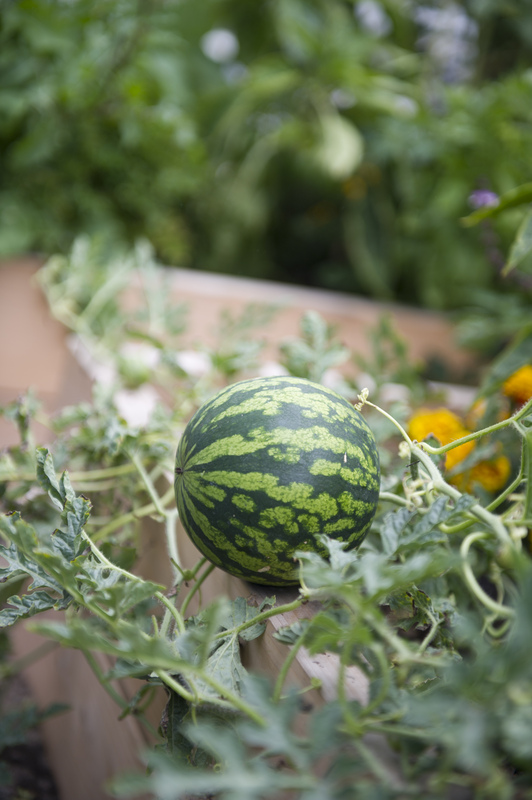 Watermelons grow best on a deep sandy loam soil high in organic matter, well drained and slightly acidic. Sandy loam soils are preferred for growing watermelons because sandy soils generally warm faster in the spring, are easier to plant and cultivate and allow deep root penetration (watermelon is one of the deepest rooted of all vegetables). When planted on very heavy soils, the plants develop slowly, and fruit size and quality are usually inferior. Yields on clay soils can be increased significantly by mulching with black plastic film to conserve moisture. Fine sands produce the highest quality melons when adequate fertilizer and water are provided. To reduce the risk of diseases, do not plant on land where vine crops have grown during the past four years. Avoid low, damp areas or pockets where cool air may collect. Soil pH can vary from 5.5 to 8. Don’t be concerned with adjusting soil pH unless it is below 5.8. Watermelon has moderate nutrient requirements compared with other vegetable crops, and due to its deep rooting it is efficient in pulling nutrients from the soil. It is best to base fertilizer application on the results of a soil test. If a soil test has not been taken, apply 5-10-10 at 30 pounds per 1,000 square feet before planting. Melons should be sidedressed before the vines start to “run.” Sidedress with a calcium-rich organic fertilizer (such as fish emulsion, bone meal, etc.-see chart) at 2 pounds per 100 feet of row. Sidedress a second time after bloom when fruit is developing on the vine. Too much nitrogen fertilizer can encourage excess vine growth and reduce fruit growth. Poor flavor and lack of sweetness can be due to poor fertility, low potassium, magnesium or boron; cool temperatures; wet weather; poorly adapted variety; loss of leaves from disease or picking melons unripe. Watermelon has male and female flowers. Male flowers produce the pollen, and the female flowers produce the watermelon fruits. Honeybees and other bees transfer the pollen. After the plant produces many male flowers, every seventh flower on a plant branch is female. All male and most female flowers drop off the plant, and fruits set more or less irregularly throughout the season. The condition of the plant and number of melons already set deter­mine the number of female flowers that set fruit later. 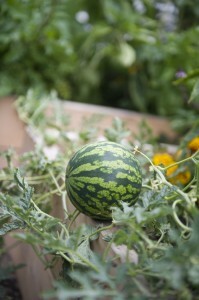 Therefore, pruning misshapen melons while small is essential to encourage additional fruit set. Flowers open one to two hours after sunrise. Female flowers are receptive to pollen throughout the day although most pollination takes place before noon. In the afternoon the flowers close, never to reopen, whether pollinated or not. Bees must deposit adequate pollen on all three lobes of the female flower’s stigma or a misshapen melon develops. Cold, rainy and windy weather reduces bee activity, which can cause poor melon production due to inadequate pollination. Even though a melon has normal shape, it will ripen at a smaller size and contain fewer seeds if pollination was marginal. When flowers are developed on the plants, do not use insecticides such as carbaryl or Sevin which are extremely toxic to bees. Misshapen melons are caused by poor pollination during wet, cool weather and lack of bee pollinators. NOTE ABOUT SEEDLESS MELONS: If you grow seedless melons, you’ll also have to plant a row of a standard seeded variety for every three rows (or three plants) of the seedless melons. The seedless melon varieties do not have the fertile pollen necessary to pollinate and set the fruit. The pollinator plant should be distinct from the seedless cultivar in color, shape or type so that the seedless and seeded melons in the patch can be separated at harvest. Because seedless types don’t put their energy into producing seed, the flesh is often sweeter than normal types and the vines are noticeably more vigorous as the season goes along. Watermelon vines require a lot of space. Plant seed 1 inch deep in hills spaced 6 feet apart. Allow 7 to 10 feet between rows. After the seedlings are established, thin to the best three plants per hill. For earliness, start the seed inside about three weeks before they are to be set out in the garden. Plant two or more seeds in 3-inch deep pots or peat pots, then thin to the best two plants. I know you’re anxious to get these beauties in your garden but DO NOT START TOO EARLY; large watermelon plants transplant poorly. Growing transplants inside at warm temperatures ensures germination of seedless varieties that require temperatures between 80 and 85 degrees F. Place black plastic over the row before planting. Use an organic starter fertilizer solution when transplanting. Planting too close results in excessive vegetative growth. Fruit in contact with soil may develop rotten spots or be damaged by insects on the bottom. Place a board or several inches of light mulching material, such as sawdust or straw, beneath each fruit when it is full-sized. Although watermelon is a deep-rooted crop able that can tolerate a significant degree of soil moisture stress, peak production requires timely irrigation. Watermelons need a lot of water. 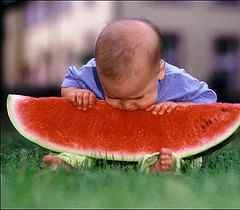 In fact, water comprises 92 percent of the watermelon fruit. If using overhead irrigation, water in the morning so the foliage has time to dry before dark. Wet foliage encourages foliar diseases. The use of drip irrigation is very beneficial in that no water is applied to the foliage but is applied to the plant root zone instead. When watering, make sure the soil is moistened to a depth of at least 6 inches. Watermelons need an immense amount of water during fruit set and development. Irrigation should be managed to minimize water stress throughout the fruit set and fruit sizing periods. Water stress during early fruit development can result in small, misshapen fruit, and the occurrence of blossom end rot (a physiological disorder in which the blossom end of a fruit ceases to grow and becomes dark and leathery). As harvest approaches care must be taken to avoid large fluctuations in soil moisture content, as heavy irrigation (or rainfall) can result in fruit splitting. Drip irrigation scheduling is determined by potential evapotranspiration (ETo) estimates and crop growth stage; frequency of irrigation can vary from once a week early in the season to daily during times of peak water demand. Regardless of irrigation technique, care must be taken to minimize wetting of the bed tops. Fruit in contact with moist soil may develop unsightly ground spots and fruit rots. Weed Control and Mulching: Watermelons should be kept free from weeds by shallow hoeing and cultivation. During the growing season, control weeds by mulching and handpulling. Mulching and handpulling are the best means of control in a small planting. During the winter and spring months, periodically check the planting for the development of winter weeds that should be removed. 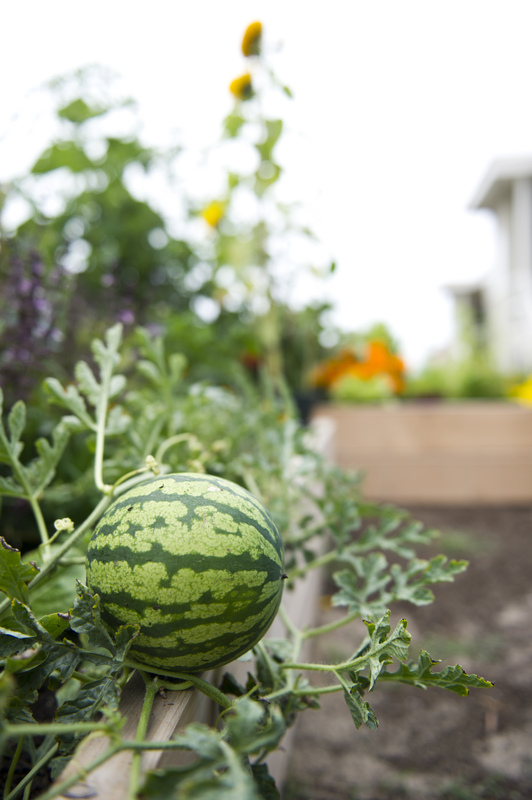 Many organic watermelon growers apply natural mulches such as straw, leaves or compost around the plants, after they become established, to control weeds. This practice is labor intensive but it conserves soil moisture, attracts earthworms and eventually enriches the field with organic matter and nutrients. To control weeds all season with a natural mulch like straw, growers need to apply a heavy layer, about six inches thick. If the straw mulch is much less than six inches in depth, weeds will soon grow right through it. The weed control effectiveness of natural mulch can be increased dramatically through the use of paper. Roll out a four foot wide strip of paper over the bare soil where the watermelon row will be planted. Apply a four inch layer of straw on top of the paper. Set watermelon transplants, right down through the straw, in a hole made through the paper. Pests – deer, crows and coyotes: barrier methods work best – fences, bird netting or floating row covers. A common problem in production of watermelons is early season infestation by Green Peach Aphids. These aphids transmit mosaic virus to the plants. They are most likely to be a problem in cool weather. An excellent natural control for both the aphids and the cool temperature is the use of floating row covers. The row cover serves as a physical barrier to the aphids and also provides a warm climate for the seedlings to get started growing. Watermelon growers will probably only want to use floating row covers just for the first 3 weeks after seedling transplants are set out in the field. The covers must be removed to allow pollination of the flowers by bees. Other natural controls for aphids include insecticidal soap, hot pepper wax, garlic sprays, horticultural oil, rotenone, pyrethrum, ladybugs and lacewings. The next insect pest that is most likely to be seen on watermelons is the Cucumber Beetle. These insects do not cause very much damage in watermelons. Cucumber beetles transmit a disease called bacterial wilt to cantaloupes. Watermelons are resistant to bacterial wilt. If they show up early in the season, they can cause injury to young seedlings. If two beetles per plant are found on young watermelon seedlings, a spray application of rotenone or sabadilla is advised. These botanical insecticides are natural poisons. Growers are advised to follow label directions with caution when using them. The floating row covers can also block cucumber beetles from young seedlings. There is evidence that both aluminum mulch and red plastic mulch repel cucumber beetles. These materials are most useful in keeping down cucumber beetle populations when the plants are blooming and attempting to set fruit. Cucumber beetles interfere with fruit set because they actually eat the stamens and pistils of the flowers. If the weather conditions become hot and dry, spider mites may infest watermelon fields. They can cause severe reduction of yields. Predator mites can be released in the field at the first sign of infestation to control spider mites. This is a relatively expensive treatment. Most organic growers attempt to control spider mites with spray applications of horticultural oil, insecticidal soap or hot pepper wax. A heavy rain controls them better than any human intervention. Bacterial wilt (spread by cucumber beetles), fusarium wilt, anthracnose leaf spot, powdery and downy mildews, alternaria blight, gummy stem blight. Blossom end rot on melons grown on acidic soils with a lack of irrigation. 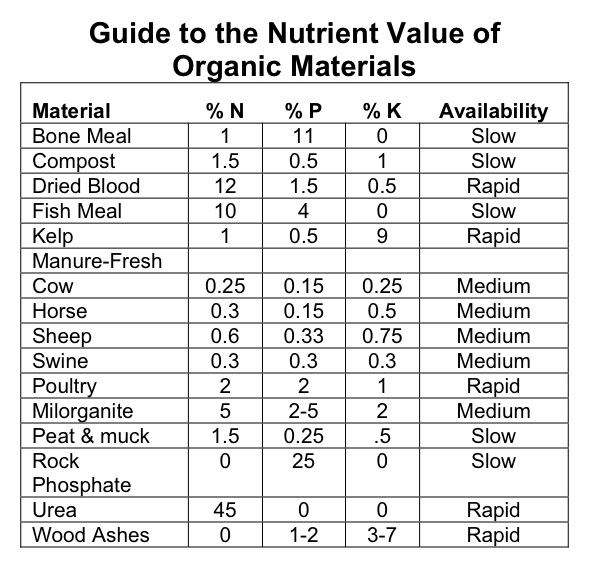 The fertility of the soil is out of balance and there are either too many or too few nutrients available to the plants. The soil pH is below 6.0 or above 7.0. Mechanical injury has occurred due to hail or reckless cultivation. Heavy rains fall throughout the growing season or the crop is grown under an overhead irrigation system. Uncontrolled populations of aphids are present in the field. 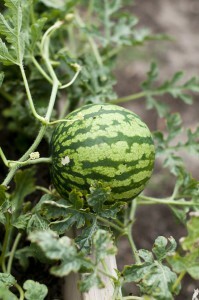 Watermelon varieties are planted that do not have disease resistance. The field is poorly drained and the watermelon plant roots stay wet for extended periods of time. Watermelons are grown in the same spot year after year. The most common controls used against diseases in organic watermelon fields are mineral fungicides like copper and sulfur. A few biological fungicides have been developed in recent years but are expensive. Sprays of copper and sulfur are effective in preventing disease but they are not effective in clearing up a disease once it is established in the garden. If you plant disease resistant varieties, practices crop rotation, maintain balanced soil fertility and use a trickle irrigation system rather than overhead irrigation, you should be able to grow watermelons organically without using a preventive spray program. It is not a good idea to spray copper materials on any garden year after year because it can accumulate in the soil and cause harm to beneficial microbial populations in the soil food web. 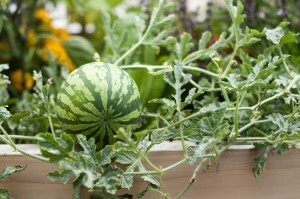 Many home gardeners experience difficulty in determining when watermelons are ripe. Use a combination of the following indicators: (1) light green, curly tendrils on the stem near the point of attachment of the melon usually turn brown and dry; (2) the surface color of the fruit turns dull; (3) the skin becomes resistant to penetration by the thumbnail and is rough to the touch; and (4) the bottom of the melon (where it lies on the soil) turns from light green to a yellowish color. These indicators for choosing a ripe watermelon are much more reliable than “thumping” the melon with a knuckle. Many watermelons do not emit the proverbial “dull thud” when ripe. For these, the dull thud may indicate an over-ripe, mushy melon. Once picked, uncut watermelon can be stored for about 2 weeks at room temperature especially if the temperature is about 45 to 50°. Uncut watermelons have a shorter refrigerator life, so store at room temperature until ready to chill and eat. Tightly cover cut pieces in plastic wrap and store in the refrigerator for 2 to 3 days.